Dan Abnett (AQUAMAN, Guardians of the Galaxy) and Andy Lanning’s (THE AUTHORITY, Guardians of the Galaxy) legendary run chronicling the Legion of Super-Heroes’ adventures are collected here in THE LEGION BY DAN ABNETT AND ANDY LANNING VOL. 1. Joined by superstar artist Olivier Coipel (Mighty Thor), the creative team introduces an uncertain and exciting future for its greatest heroes with gripping characterization, cosmic-level threats and epic sci-fi storytelling! Earth at the end of the 30th century. A super-modern age, and the pinnacle of human cultural endeavors. Then came the Blight. Who they are is irrelevant. What matters is what this highly advanced, techno-organic culture wants: the life energies of the worlds they come across. Upon infiltrating the United Planets’ means of hyper-accelerated interstellar transportation, the Blight entwine Earth and destroy its forces within hours. Where life once flourished, it now deteriorates. And those who don’t die meet a worse fate: they become of the Blight. 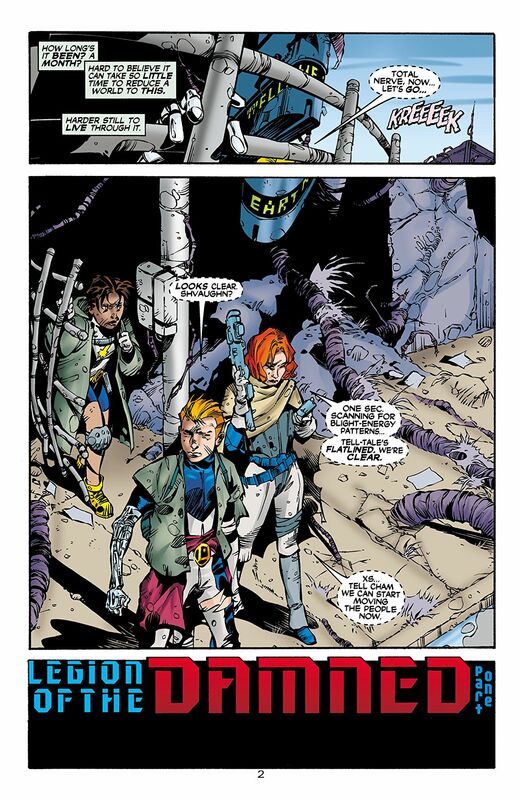 That includes the Legion of Super-Heroes, the U.P.’s young champions. Unable to fend off the invaders, their once-great numbers now serve the Blight and hunt down the last resisting Legionnaires—the ones looking to find enough survivors and open one last Stargate to freedom. 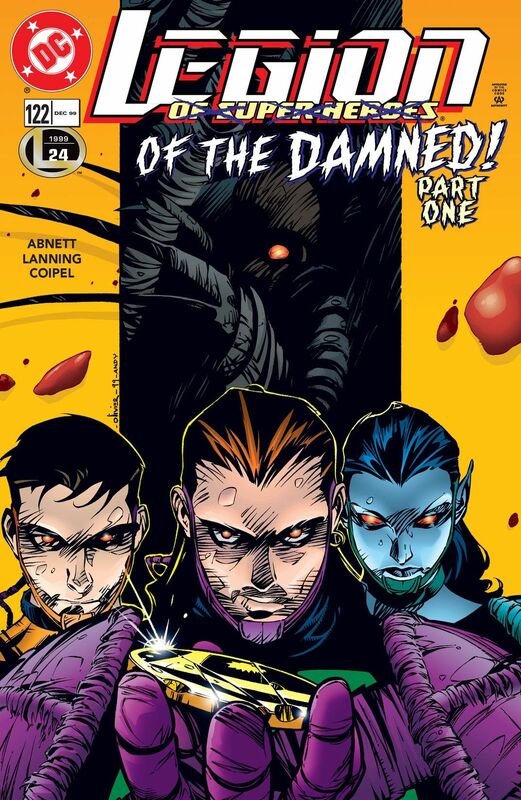 Earth, the United Planets, the Legion of Super-Heroes…they’re all damned. Collects LEGIONNAIRES #78-81, LEGION OF SUPER-HEROES #122-125 and LEGION OF SUPER-HEROES SECRET FILES #2. So, I’ve been on a bit of a Legion of Superheroes kick lately, binging through a bunch of the old stories. Prior to this particular collected edition, I’d just finished off a run of Legionnaires (writing credits to Mark Waid, Tom McCraw, & Tom Peyer) that collected LEGION OF SUPER-HEROES #0, #62-68, and LEGIONNAIRES #0, #19-24. It was a great read, very much in the spirit of the old comics I read as a kid. 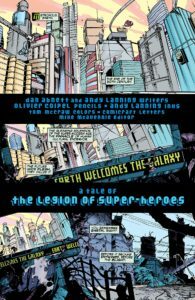 See, my reading relationship with the Legion goes back… way back, and that first collection of stories really hit me in the nostalgia. Not wanting to stop there, I kept it going and loaded the Dan Abnett/Andy Lanning run onto my iPad, compliments of ComiXology‘s holiday sale. At first, I was a little put off… primarily by the art laid out by Olivier Coipel. It just didn’t look anything like what I was used to seeing in the pages of a Legion comicbook. The world of the 30th century was supposed to be clean and crips, with clearly drawn lines and bright colors. 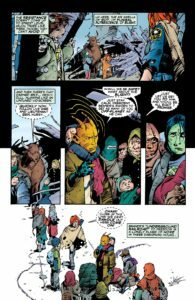 Coipel’s work was sharp edged and chaotic, setting a totally different tone… which as I read on was pretty much the point. See, at the time DC comics was in the midst of one of their many reboots, and the Legion of Super Heroes was starting to hurt. 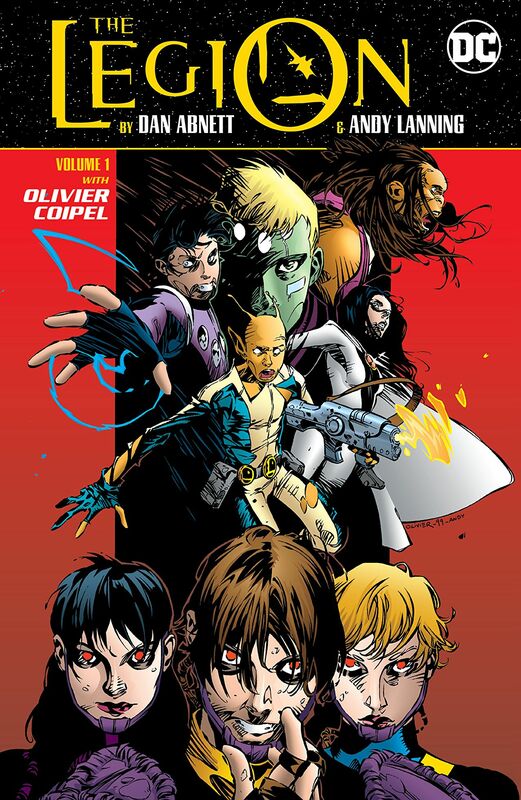 One of the mainstays of the comic world, the Legion had been retconned near to death, and their continuity was more of a mess than any of the other titles on DC’s roster. In a last ditch bid to overcome the doldrums they were sinking into, the reigns were turned over to Dan Abnett, probably best known for his Warhammer 40K novels, and a master when it comes to galaxy shaking science fiction. 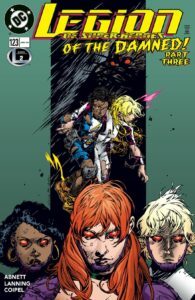 Partnered with Andy Lanning, more of a traditional comic guy, the Legionnaires were put through paces never before seen in the pages of any of their books. No longer the clean and optimistic tale, Legion of the Damned was as dark a story as you’re likely to see in a comicbook. It involved the galaxy-wide incursion of the alien threat of the Blight… and I say “alien” in a way that acknowledges the existence of the many worlds, races, and cultures spread across the vista of the 30th century… by way of the star gates. Landing on Earth and laying waste to its cities, the Blight corrupted everything in their path. Their overriding goal: destroy all life in order to finally end their own eternal curse. The only thing standing in their way: the remnants of the Legion, those few who hadn’t yet fallen to the Blight’s unwavering advance. Once I got over the system shock of this totally new approach to the Legion, I became acutely aware of how unbelievably friggin awesome this story was! Abnett and Lanning had taken something unerringly familiar, torn it to pieces, and crafted one of the best continuity-fixing stories I’ve ever read. 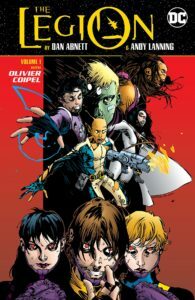 To go along with the writing, the main part of the arc was drawn by European artist Olivier Coipel, a relative unknown here in the U.S. Like I said, his style isn’t one that had been seen much in American titles, and once I got over the shock it went a very long way toward putting a finely ground edge to the story. 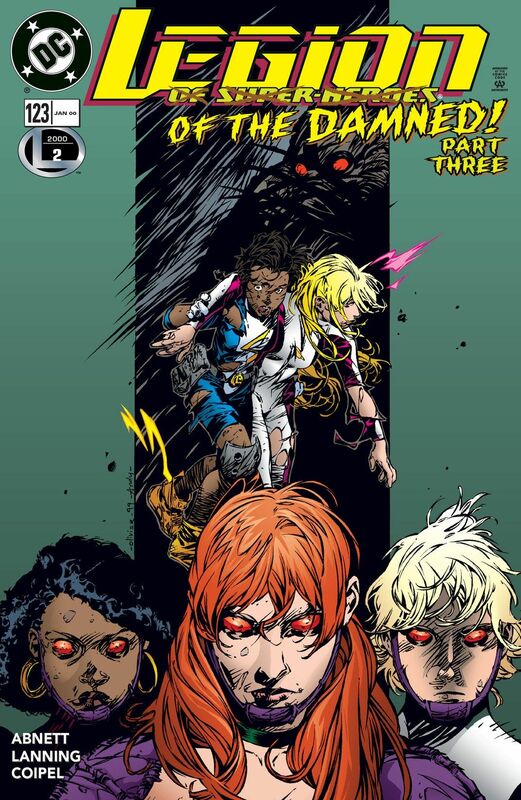 If you’ve ever had any affinity for the Legion of Super Heroes, do yourself a favor and give this run a look… I don’t see how you could possibly be disappointed, but if you are I’d be happy to discuss it with you and tell you how you’re so very wrong. I have to go now… I’ll be waiting at the mailbox for my single issue original copies.